If you love fishing but have never tried to do it from a kayak, I highly recommend you give it a go, assuming you are able bodied, of course. I was quite the fisher-lady in my time, and many of my fondest memories of fishing were made from a kayak. If your only experience in a paddling vessel is a canoe from summer camp, you will be surprised just how stable the modern kayaks are. Many sit-on top kayaks are so stable in fact, you actually have to try to get them to roll over. The benefits of kayak fishing are numerous. The first I’ll mention is the “stealth factor”. Any serious fisherman knows that “spooking” the fish can be detrimental to your success, and kayaks give you the ability to truly sneak up on your gill breathing prey. I was out fishing with a few friends in kayaks in the intra-coastal in Florida. For about an hour we were pulling out Sea Trout and Redfish every couple minutes, that is, right up until some gentlemen in a power boat came screaming into the area. Just like that, the bite was gone, and stayed slow for the next hour. I’ve seen it happen time and again while fishing in the salt water flats, we are on the fish until someone shows up in a boat and spooks them. That brings to mind the next advantage, which is maneuverability. Once again in the salt water flats, there are areas in and through mangroves, as well as spots accessible only past shallow areas of less than a foot of water, that can be absolute gold. You’ll never be able to access those spots in a boat, even if it has flat bottom. One of my old favorite spots, you had to scuttle through a long mangrove tunnel in about 6 inches of water, pass down a tiny stream through a neighborhood, and pop out into a brackish river. Literally inaccessible to anything but a kayak or canoe, this spot produced fish as fast as you could cast for them. One thing I really enjoy about kayak fishing is the feeling of being right down on the water on a more level footing with the fish. You feel so much less separated from the environment. Not to mention, you’ve never lived until you’ve hooked up with a Redfish big enough to pull an un-anchored kayak. Sitting right down on the same level as your adversary just adds another level of excitement to the sport. Another point is a positive for me but may be a negative for you. Whether you are paddling or peddling, kayak fishing gives you exercise. It’s not necessarily grueling activity but it’s just the right amount of expending energy that gives you even more satisfaction for your efforts when you get to that perfect spot and pull in the “big one”. If you take the time to learn the proper paddling stroke, you can paddle for hours without wearing out. It’s all in your technique, and learning how to minimize your effort while maximizing the use of your entire body, instead of putting all the strain on your arms. I could drone on for hours about fishing and more specifically kayak fishing. It’s one of my absolute favorite hobbies. 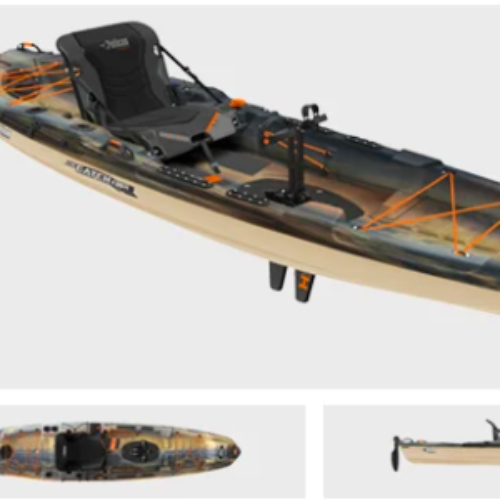 I sincerely wish for one of my loyal fans or subscribers to win this versatile Pelican Catch 130 kayak. I know if you win it you’ll fall in love with the sport just like I did. If you’ve already dabbled in kayak fishing, let us know in the comments below what you think about it. I started kayak-fishing in 1991with a cheap plastic yak, but now am in a sleek Hobie Outback with pedals. Makes a big difference in your fishing enjoyment. It’s thrilling to be pulled around in the kayak by a 15-lb bull redfish! Nice! I have a Hobie Odyssey, aka the “Divorce Special”, because it’s a tandem. Sadly no pedals. I want to Win a Pelican Catch 130 Hydryve Fishing Kayak.